In Engineering different types of Ignition Systems are used in Internal Combustion Engine. Out of that Magneto and Coil Ignition Systems are more important. Hence I will share information on a comparison between these two ignition systems. The Manufacturing cost of Coil Ignition System is low, due to less precision work than to Magneto Ignition System. The Wiring in the Coil Ignition System is quite complicated hence this system requires greater attention against possible defects. But in Magneto ignition system the wiring is comparatively simple and it forms a compact unit. The condition of the Battery and Charging Dynamo will greatly influence in an operation of the Coil Ignition System. If the Battery gets discharges, it becomes very difficult to start the engine by hand cranking. This difficulty will not experience in Magneto Ignition System, hence it is more reliable. A good Spark will get in Coil Ignition System at starting at spite low speed. 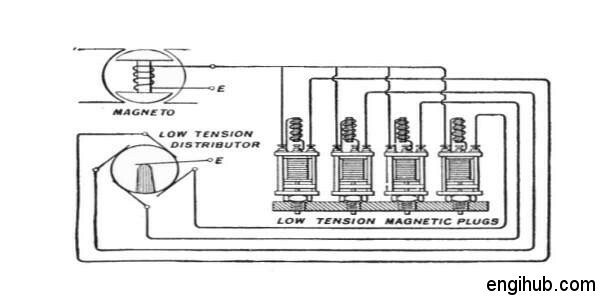 The strength of the Spark in Magneto Ignition System at the time of starting and at low speed is very low. With the increase in speed the strength of the Spark given by the Magneto Ignition System increase but it decreases in the case of Coil Ignition System. Coil Ignition System cannot be used in High-Speed Racing Cars and in Airplanes.